Released in 1982, just two years after the original Pac-Man, Ms. Pac-Man became an almost instant hit. There were accusations of cashing in on the original game, but if people are happy to pay for more of the same, why not?! 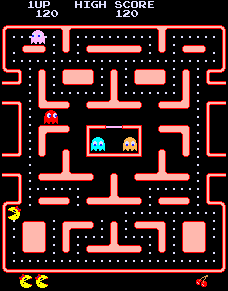 There are several subtle differences between Ms. Pac-Man and its predecessor, for example, it has four difference mazes where the original had only one.